India and China dominate the Asian continent but are separated by formidable geographic barriers and language differences. For many centuries, most of the information that passed between the two lands came through Silk Route intermediaries in lieu of first-person encounters—leaving considerable room for invention. From their introduction to Indian culture in the first centuries C.E., Chinese thinkers, writers, artists, and architects imitated India within their own borders, giving Indian images and ideas new forms and adapting them to their own culture. Yet India's impact on China has not been greatly researched or well understood. JOHN KIESCHNICK is Robert H. N. Ho Family Foundation Professor of Buddhist Studies at Stanford University and the author of The Impact of Buddhism on Chinese Material Culture and Eminent Monk: Buddhist Ideals in Medieval Chinese Hagiography. Profile page. MEIR SHAHAR is Associate Professor of Chinese Studies at Tel Aviv University and the author of The Shaolin Monastery: History, Religion, and the Chinese Martial Arts and Crazy Ji: Chinese Religion and Popular Literature. Profile page. Kieschnick, John, Shahar, Meir (2014). 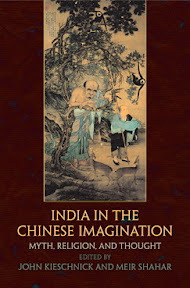 India in the Chinese Imagination: Myth, Religion, and Thought. Encounters with Asia. viii, 305 S.